What is a Settler ? It is a comfortable way to support a tablet, ipad, Kindle, ereader, games console or just a good old-fashioned book on a table, desk or on your knees at the angle you want, leaving your hands free. Like every good idea, it is simple and easy to use. No more cramped thumbs and joint pains holding the pad or book at the right angle to read - just settle the bottom edge behind the front strip on the settler and lay it back and adjust until it is at the perfect angle for you. 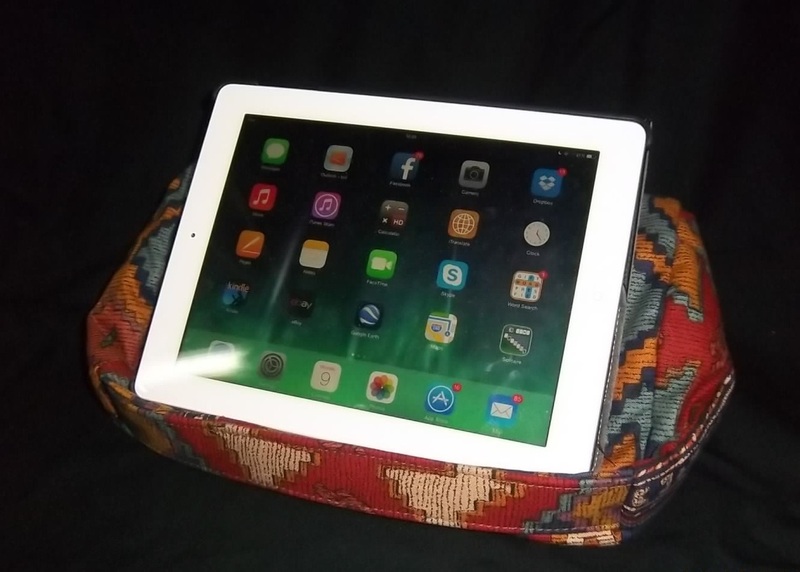 Ideal for using on your knees when relaxing, the Settler moulds into shape giving a firm support so you can use your tablet, reader or book easily without having to hold it, leaving your hands free and relaxed. It comes in many different colours and materials and does not look out of place in the sitting room, bedroom or anywhere else. Keep one beside your favourite reading chair, your bed or on your office desk. Choose the colour and fabric that you would like and we will do our best to supply it - but if you can give us a second choice too the we would appreciate it. Our stock of materials varies all the time so most choices can be accommodated. Contact us for other country rates.